The London Women’s BJJ Open Mat has been running for a year and a half and is going from strength to strength. Our fifth event, held today at Mill Hill BJJ, saw twenty women – from white to purple belt – come together for an informal morning of drills and sparring. 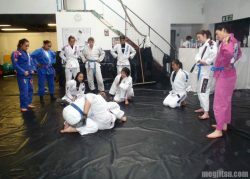 Our events are open to everyone and women representing clubs across London and the Southeast were on the mats. We even had three intrepid women travel from the Netherlands and one representative come from Germany. The open mat followed a similar pattern as previous events with a short warm-up followed by technique drills followed by sparring. On this occasion, we worked techniques from guard and half-guard. From guard, we focused on breaking the opponent’s posture and adjusting our angles and grips to allow for triangles or for moving to the back. We also looked at the ‘old school’ sweep from half-guard, a personal fav of mine! As usual the techniques were shared in an organic, informal way by members of the group with women swapping round their partners to meet and work with one another. The atmosphere of the open mats is unique and inspiring. Women, many of them tough and seasoned competitors, spar with one another in a completely friendly and warm-hearted way. There was some fierce work on the mats, but equally all experience-levels, sizes and abilities worked together and adjusted their games accordingly. It is such a fabulous opportunity to roll with women outside of competition which is, for many female practitioners, the only regular opportunity to work their game with a female opponent. I was struck by the variety of the women’s games and encountered some new answers to my ‘moves’. It is a truism that variety in training partners is essential to development of a robust game and the open mats provide a tremendously valuable opportunity for women to train with other women; a demographic outside many women’s normal range of training partners. The women who attend the open mats recognise this and embrace the opportunity in a good-natured way. Grappling women are invited to join our Facebook Group to hear about our upcoming events! Thanks to Marjolein Groenen for use of the great photographs. It was a good day, Triin! Such a great thing going on and a perfect opportunity to encourage women of all levels.